Mompesson House is located in Salisbury, in the Cathedral Close. Built in 1701, it has been beautifully restored. I fell in love with it when I toured it in 2003. I was writing SLRM at that time and I was particularly struck by the drawing room, with its elaborate plaster work and red flocked wall paper. 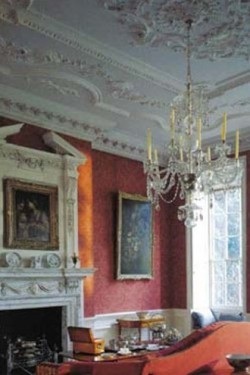 I could absolutely picture Sopie designing such a room for Charles and his political cronies and I used it as a basis for one of the rooms in Charles’s Sevenoaks house. Can’t you just see the portrait of Lady Dayle and her sons hanging over the mantle?